I feel privileged to be working for a company that recognizes the value that military experience can bring to the civilian world. 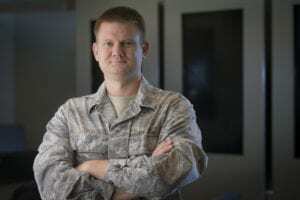 Personally, I have seen firsthand how my experience and training with aviation electronics in the USAF prepared me for the career I enjoy today. Schneider Electric is making great strides in recruiting military veterans here in the United States, and has earned the status of Military Friendly® Employer. You might be thinking that hiring military veterans is a no-brainer, after all the military uses a lot of power, has data centers and buildings that need climate control and energy management systems. We have even sold PLC’s that are now running mission critical weapon systems for our military. With all the obvious synergies between military operations and power, energy management and automation, why single out military veterans from civilian potential hires? One reason is that military veterans have been living in a unique culture in the service. The transition to civilian life is often difficult for them. This seems counter-intuitive as civilian working conditions typically offer lower stress, better pay and less hours. Yet, I’m sure you are aware of soldiers who volunteer for multiple tours of duty in war zones. They usually cite reasons like they miss the camaraderie, purpose and intensity that they left behind in the military. For companies that are recruiting vets, this is important to know as perks like a ping pong table and beer in the fridge might not resonate as much as a strong mission statement or a culture of teamwork (OK, beer in the fridge works for everyone). However, most hiring managers today won’t be military veterans. Military participation rates have been dropping steadily since the Korean War. Without the frame of reference of military experience, qualities that are attributed to veterans such as loyalty, leadership, respect, integrity and teamwork may not be recognized by recruiters and hiring managers. Schneider Electric is addressing the unique needs of veterans via military specific recruiting specialists and events. Our talent acquisition folks attend four Military MOJO (Municipal Order and Justice Office) recruiting events annually along with the SACCs (Service Academy Career Conference) career fair that targets graduates from the US Military Service Academies. Schneider Electric also supports local veteran initiatives such as Roger Staubach’s Allies in Service in the DFW, TX area. Throughout the year they also attend various military base and online career fairs to target transitioning military members and their spouses. We also have started military veteran business resource groups (BRG’s). Our BRG’s are comprised of volunteer employees who share common interests especially in the areas of professional development, corporate culture and improving business results. The BRG’s are recognized and funded by Schneider Electric. Our Veteran BRG’s are active in ensuring that military veterans are recognized and appreciated within the company culture. They also work with external organizations, volunteering to help veterans who have been negatively impacted in the service of their country. I am proud to work for an employer who recognizes the strengths and skills of veterans, and empowers them to grow in their career. So, if you are a military veteran with experience or interest in the business of electrical power, energy management and automation, (and cool emerging technologies like IoT) check out Schneider Electric, where Life is On! Thank you for your service, and for sharing your experience as a Veteran within Schneider! Great people make Schneider Electric a great company.